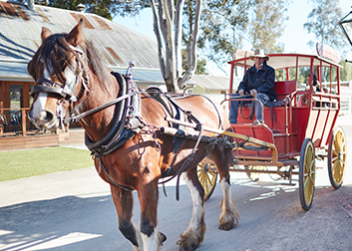 Let our resident horses Harry and Gemma take you on a leisurely ride around our Mallee township in the Settlement’s own unique carriage. Rides are free with entry to the Settlement – just meet them under the Peppercorn tree at the end of the main street, outside the saddlers shop. 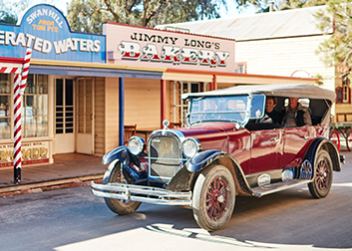 There’s no air-con, no power windows and certainly no cruise control, but a trip to the Pioneer Settlement wouldn’t be complete without a ride in our lovingly-restored 1920s Dodge. Rides are free with entry to the Settlement – just meet one of our friendly volunteer drivers outside the Saddlery. The Pyap serves a range of snacks and beverages on board. Contact us to secure your seat. Find out about private functions. Despite her great size – she is almost 30 metres long and 4.8 metres wide – she has a very shallow draft which means she can float in less than a metre of water. In her early days she was used a floating general store. 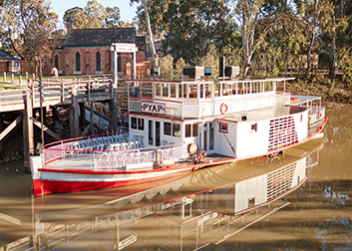 She travelled the lower Murray River, stopping at small towns and farm stations along the way. Inside, she had a serving counter, a store section and a separate drapery at the rear of her lower deck. The crew slept on the upper deck. The PS Pyap travelled 500 kilometres each week selling goods to settlers at over 60 settlements and landing places along the river.